Whether it’s the swooping lines of 60’s British cars, menacing classic Americana, 80’s wedge or any other era, one thing is for sure, we all have a favourite classic car. In the past, collecting classic cars was seen as a time consuming and potentially financially ruinous hobby, but the times really are changing. With classic cars now hot property thousands of us are snapping up our favourites, not only as a toy but as an investment for the future. 1. Look inland – Classic cars are notorious for being susceptible to rust and there really is nothing worse than seeing your beloved classic turning into a pile of oxidisation. Salt water is especially damaging for chassis and metalwork so looking inland can help you to avoid the rust issue. 2. Take a mechanic – If you are going to see a potential investment then it can pay to take along a mechanically minded friend or to take the car to a local mechanic before committing. 3. Take it for an extended test drive – Many issues that a classic car can have, won’t rear their heads on a short test drive, so make sure you arrange for an extended test drive. It’s important to not be precious about the car too; drive it with a little gusto as this is sure to highlight any obvious mechanical maladies. 4. Barter! – If your chosen classic has a few dings and dints then make sure that you highlight these to the seller. Being belligerent will get you nowhere but gentle and insistent bargaining can net you great savings. 5. Fix it up – As a leading provider of car body repairs in Wimbledon we know just how important it is to get your classic car looking good before selling it on. By letting us buff out all those rough edges you are sure to polish some more profit into it. Following these tips will hopefully make sure that you end up with a wallet that won’t fit in your pocket and happy memories of your days with the car. If you have any questions on any of our services then don’t hesitate to contact us and we will be happy to help. London is a busy city, the traffic is dense and the driving is sometimes, well… erratic. This is not good news for the car owners of the capital who take pride in their appearance of their vehicle and strive to keep that paint job blemish free. Thankfully, we’re an observant bunch at SmartWay and we’ve vigilantly kept watch on the roads of London, staying alert for dent-inducing driving so we could bring you this handy guide to avoiding dents when you’re driving in the big smoke. We know you’re not exactly spoilt for choice when it comes to parking spaces in London, but if you want to keep your bodywork dent free you can afford to be picky. Don’t park too close to other cars; a carelessly opened door or some lead-footed reversing from the car in front of you could be all it takes to leave a nasty dent in your pride and joy. Let’s hope they leave their insurance details along with the dent. When we say smart cars, we mean tidy looking cars, not the miniature automobiles weaving in and out of traffic. If you park next to a heap covered in dings, rust and scratches it’s quite likely the owner doesn’t care too much about their car. It’s also quite likely they won’t care too much about your car either as they pull out and add another bump to their expanding collection. It’s not just the city streets where the risk of an unforeseen dent is high; you’re not safe at home either! That is unless you keep your garage tidy, in which case your chance of a bump on home turf is significantly reduced. However, a garage filled with clutter is a scratch on that perfectly manicured paintwork or a dent right on the bumper waiting to happen. If you’re watching out for a protruding rake and precariously placed pots of paint next time you’re reversing into the garage, then it’s probably time to think about a clear out. SmartWay specialise in car dent repairs in Wimbledon, South London and beyond, so if your vehicle has suffered a bump and could do with some TLC restoring it to its former glory, then do not hesitate to contact us or give us a call on 07732 542500. Car owners tend to fall into one of two categories when it comes to car bodywork. The first group contains people who experience genuine distress when they see even the slightest scratch upon their prized vehicle, and who instantly run to try and get the blemish sorted. The second constitutes those individuals who drive around in a car so dented and dishevelled that it would look more at home in a scrap yard. They may notice if a door fell off, but anything less is not likely to register. The simple fact is that the state of your car’s bodywork matters on the day when you’re looking to sell it. Even apparently trivial dents can knock a huge hole in the price that you’ll get for it, so it pays to keep on top of your bodywork maintenance. Sometimes, it might not feel like washing your car achieves all that much, but actually removing the chemicals and salts from rain or dirt is highly beneficial. Dirty bodywork not only looks unsightly in the here and now, but it also can lead to more deep-seated problems when you finally come to sell the vehicle. In addition, washing the car lets you have a good look around the bodywork, so you’ll be far more likely to spot any real ‘damage’ before it begins to worsen. A car that’s been in a bump can easily have found itself with an out-of-line chassis, even if the resulting dent isn’t that big. Unless the damage is investigated, you may never know, although your bank balance certainly will when you try to sell the car. Even a small scratch can cause the value of a car to plummet, and a scratch that starts small could easily get worse or rust if it’s not attended to. It’s all too easy to damage your car’s bodywork – you might catch the bumper in a confined space, for example – and that’s to say nothing about damage that is caused by the activities of other people or even animals. If you find that your car’s bodywork is in need of some attention, then we welcome you to bring your requirements to the team at Smartway. We offer car body repairs in Wimbledon, and our mobile vehicle repair service can be tailored to suit very precise needs. If you’re looking to sell your car, the state of its bodywork is a huge factor that will determine the price it goes for, so don’t neglect to bring your scratches, scrapes or scuffs straight to us. Take a look at the above image to see the kind of difference we can make! For more information, contact us now by calling 07732 542500. When your car is regularly exposed to fluctuations in temperature, the paint will expand and contract. Over time, this will result in small cracks and openings in the paint surface, which allows the infiltration of moisture, salt and other chemicals into the surface of the paint. These substances will cause rust and rapid deterioration of the paint. Consider keeping your car in a garage in order to avoid this! These two substances are often used at weddings in order to depict a message, such as ‘just married’, on the back of a car window. If either of these two materials gets on to the car paint, they are very difficult to remove, and more often than not, they will make a permanent mark. If you regularly leave your car in an area that is having construction work done, you run the risk of having the paint damaged. The dust will play a significant role in the damage of your car’s paint job, as will wet concrete – if it sets in place, it will leave noticeable marks when it is scraped off. Bird droppings can be quite damaging to car paint. They naturally contain chemicals that erode paint and expose the underlying layers. If either petrol or brake fluid comes into contact with your car’s paint work, it could cause peeling and damage. Objects as everyday as a key can cause an immense amount of damage to your car’s paintwork. Criminals often commit damage of this kind, and it is cars that are regularly left for long periods of time in an unsecure place which become victim to this type of vandalism. Driving on un-surfaced roads at high speeds can cause stones and rocks to collide with your car’s paint surface. It is important to use only specialised exterior car-cleaning materials, as generic cleaning products could be detrimental to the car’s painted surface. 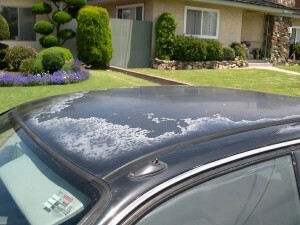 Rough or dirty cloths could easily scratch the surface of your car. You may wish to consider investing in a soft, purpose-built cleaning cloth which will preserve the appearance of your car’s painted surface. If your car has unfortunately picked up a scratch, scrape, scuff, or chip to the paint, our professional technicians can conduct high quality car scratch repairs or car dent repairs to remove any such damage from your vehicle. If you are looking for car body repairs in London, or mobile car body repairs in London, please do not hesitate to contact us here at Smartway London! Hello and welcome to the brand new Smartway London blog. We would like to thank you for dedicating your valuable time towards visiting this page and we encourage you to keep doing so, as we will be regularly updating our blog with industry-related news and other information of equal relevance. To begin with, we would like share a bit about who we are and what we do as a business. As our clients will already know, at Smartway London we are a specialist mobile car body shop in Wimbledon. We are able to provide you with professional assistance concerning any aesthetic defects that you need fixing. From minor bumper scuffs to very noticeable scratches and dents, we have encountered it all, so we have the necessary equipment and knowhow to get your car looking as good as new in no time. Our services have gained a highly regarded reputation for being fully comprehensive as our competences extend beyond fixing dents and scratches. Our other areas of expertise include repairing kerbed alloy wheels, repainting damaged surfaces and a host of other aspects related to repairing vehicle body defects. Whatever the service you require, we will make sure it is completed just how you want it done! At Smartway London we are aware of how much of a valued asset your vehicle is, and how the appearance of any scuffs and dents can be somewhat irritating as they can become the most noticeable feature of the car. This is why all of the services provided at our mobile car body repairs in London and the surrounding areas are available at very affordable prices without compromising on the quality of the outcome. We incorporate the most advanced technological methods into our repairs to make sure your vehicle is better than ever when we have finished our job. So as mentioned earlier, if you have issues with any scuffs, scratches, dents or kerbed alloy wheels be sure to contact us at Smartway London on 07732 542 500. We have the experience and the gear at our disposal to help you with any problem no matter how big or small it is. Yet again, thank you for reading and stay tuned for more blogs. We hope to be of help in the future one way or another!